DHTMLX Form Builder is an online tool intended for making the process of creating forms easier. 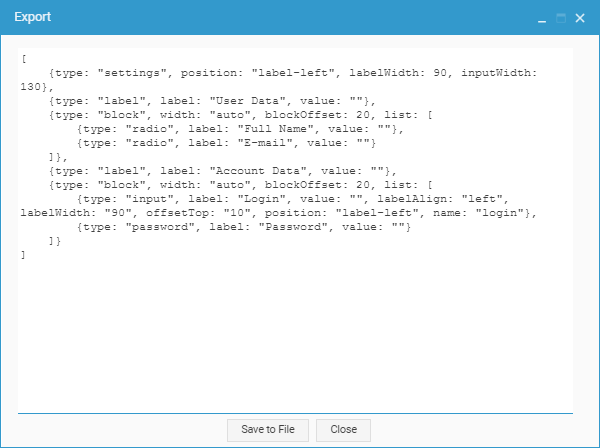 It allows you not to write huge amounts of code for positioning and arranging elements in a form. You just add columns and blocks and fill them up with desired controls. Then take the ready-made code and insert it into your application. As simple as that. Try and enjoy! Toolbar - contains buttons to manipulate data export/import and allows repeating or canceling actions. 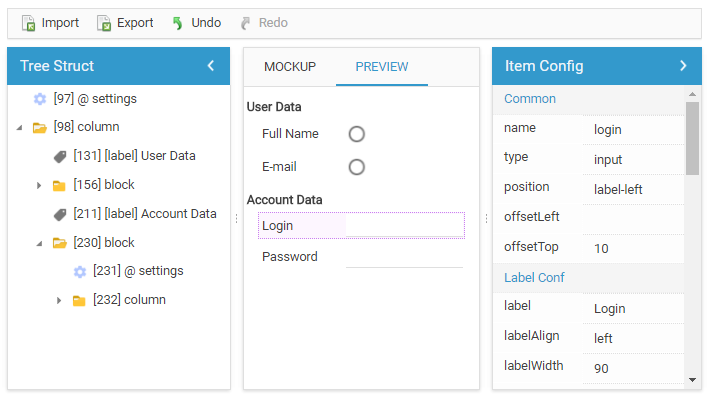 The biggest form components - columns are displayed as folders. Blocks/fieldsets with form controls are placed as nested folders inside columns. Controls are located inside of columns, blocks or lie separately. The Settings elements define configuration settings for each block/fieldset of controls. Preview - is intended for previewing the resulting form. 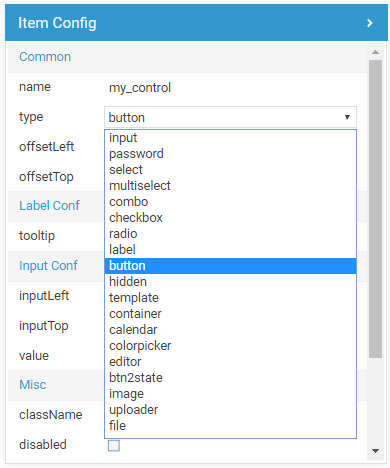 Item Configuration Block - the very right part of the Form Builder, displays the list of possible elements' properties that can be tuned to get the desired interface. 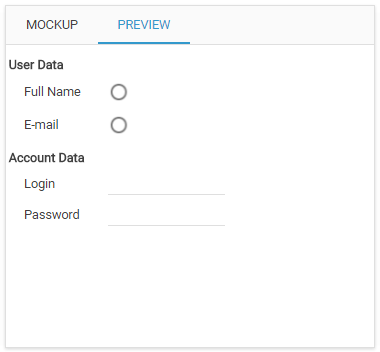 Start creating the layout of your future form in the Mockup tab of the Editor view. To add a new block, a column or a separate control click the icon. 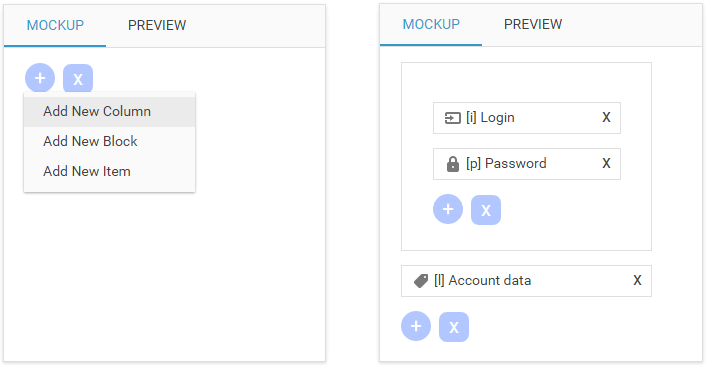 You can also import form configuration into Form Builder in JSON format. To remove a column or a block, click the icon. To delete an unnecessary item, use the cross sign in the input container. 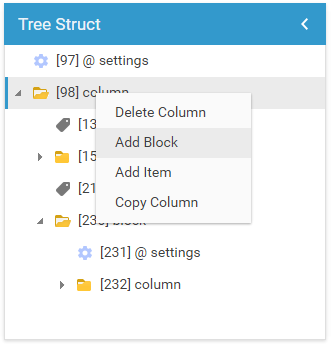 You can also add, delete or copy a column, a block or an item in the Tree view. Just call the context menu by right-clicking the needed form element and choose the corresponding menu item. By default, all items are added into the mockup as inputs. 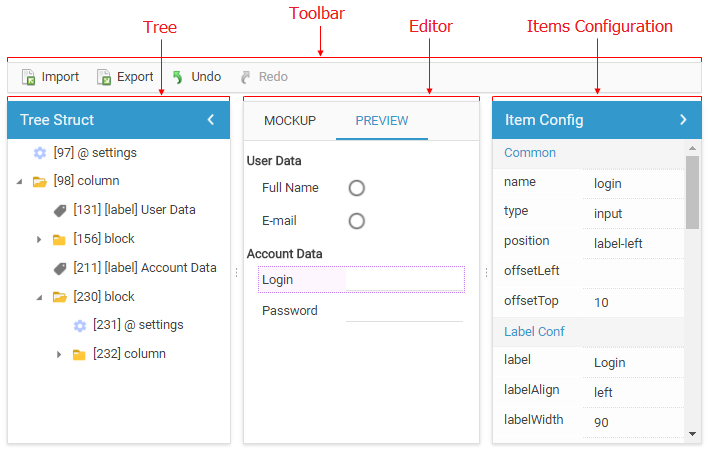 To set the desired type of the control, select it in the Mockup tab or the Tree view and choose the type you need in the Items Config view. 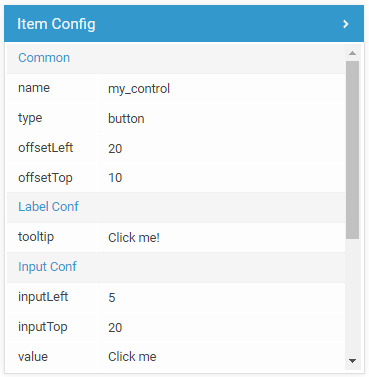 To tune the appearance and position of a form control in a proper way, define values of other control's properties in the Items Config view. To see the current result and fix the elements position and arrangement, go to the Preview tab of the Editor. To save the created form configuration, click the Export button. The resulting code of your form will appear in the popup window. Click "Save to File" and form structure will be exported into a file as a JSON object.